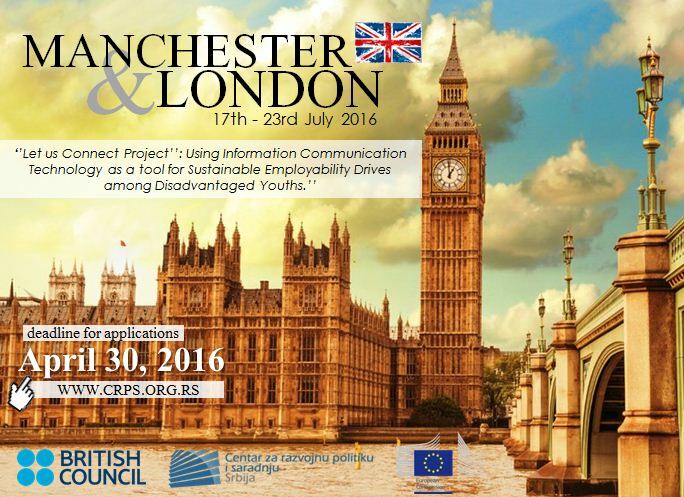 Centar za razvojnu politiku i saradnju (CRPS) ima zadovoljstvo da vas pozove da se prijavite na konkurs za omladinski trening ‘’Let us Connect Project’’: Using Information Communication Technology as a tool for Sustainable Employability Drives among Disadvantaged Youths.’’ koji će se održati u Mančesteru u Velikoj Britaniji od 17. do 23. jula 2016. godine. Pravo prijavljivanja i učešća imaju svi mladi iz Srbije starosti od 18 do 27 godina. Prijavljivanje se vrši popunjavanjem aplikacione forme (ispod), za više informacija pišite isključivo na mail konkurs@crps.org.rs sa nazivom mail-a “UK-TC”. Organizator snosi troškove vize, smeštaja i hrane. Učesnicima će biti refundirani putni troškovi u visini do 275 evra. Planirana je trodnevna poseta Londonu. 18.-30.04.2016 (23:59) – Rok za prijave. 01- 05.05.2016 – Kontaktiranje odabranih učesnika. 10.05.2016 – Rok za uplatu participacije (u iznosu od € 20) za odabrane učesnike. 12.05.2016 – Predstavljanje programa i potpisivanje ugovora o učešću. Record shown that about 75 million people lacked basic ICT, reading and writing skills making it hard to get a job and increasing their risk of poverty and social exclusion according to a European Commission Literacy Report. In recent years, ICT skills and competencies has come to be seen as crucial to the economic performance of industrialized nations as it is no longer defined merely in terms of a basic threshold of reading ability which everyone growing up in developed countries is expected to attain, rather, it’s now equated with an individual’s ability to use written information to function in society. Unlike their predecessors, people today need a higher level of ICT skills to function well, as the society becomes more complex and low-skill jobs are disappearing, inadequate levels of ICT skills therefore have serious implications not only in developing countries but also in developed ones. Bearing this in mind in line with European Union policy and drive to reduce lack of ICT skills and employability drives among disadvantaged young people ‘Let’s Connect Project’ is designed in collaboration with young people, trainers and youth representatives to actualize EU policy goals through empowerment skills acquisition by this group of people. Functionally, a strategic partnership of disadvantaged young people of like minds on visualizing structural misalignment in ICT knowledge in participating countries decided to map out an action plan to address the issue of inadequate levels of ICT skills, especially at the international levels involving trainers, youth workers etc. who are agents of change and learning. modernizing education, training and youth work in line with European Commission’s key priority. * To encourage disadvantaged young people, present and future trainers, youth workers, project multipliers and youth representatives to connect, learn how to deliver empowerment and employability skills training using Information Communication Technology, social networking media processes etc.